Specially bred to produce large melons out of doors. 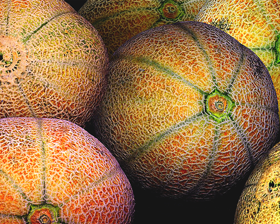 The fruits of Melon Pineapple can average 2-2,5kg and are tender, juicy and sweet. This fantastic flavoured fruit have a refreshing, delicate pineapple taste and bright orange color. Melon Pineapple is ideally suited to a warm, sheltered, sunny spot of the garden or greenhouse, frame or polytunnel. Resistant to powdery mildew and Fusarium. Ready to crop in 75-95 days. Sow the seeds April-May and plant out in June 1cm deep in a good seed compost. Germination usually takes 6-10 days at 24C.